Conquer Evil by Doing Good | God's Abundant Blessings! Posted on April 20, 2012, in Forgiveness, God's Blessings, God's Grace, Transforming and tagged Corrie ten Boom, Elie Wiesel, Holocaust, Romans 12, survivor. Bookmark the permalink. 2 Comments. When I was in DC we had the opportunity to visit the Holocaust Museum. As you shared, I was humbled, grief-stricken, and angry at what happened. I recently read a poem to my kids by a Pastor who wrote that they kept coming for people but he never said anything, so when they finally came from him there was no one left to speak on his behalf. I am praying that God will help me to put a “watch upon my actions” and help me to think before I speak, and I am encouraging my students to do the same. God’s Peace to you. Totally agreed Jen. Just a life-provoking experience. 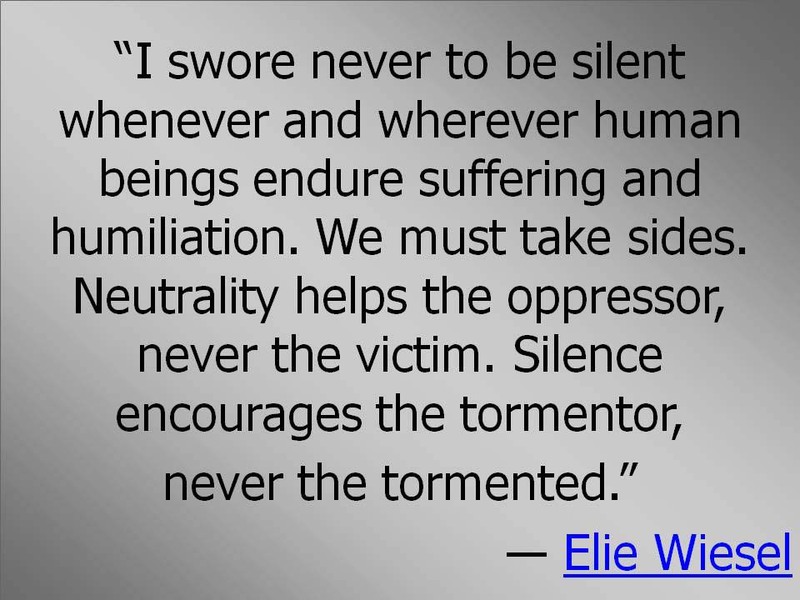 Want to make sure I don’t remain silent while others get hurt or mistreated or discriminated against.